The holidays can often be a tough time of year for physical therapy practices. Patients are busy with family events, school activities, and prepping for the holidays. This usually leaves going to PT pretty low on the To Do list. How can practices plan to offset the end of year slow down? The answer: with holiday marketing campaigns! The season’s major holidays might be at the end of December, but the holiday season can start as early as Halloween. Think about your local superstores—they start selling Christmas trees the first week of November. The best way to start planning for your December and early January marketing is to look back at last year’s stats for those months. When did you start to see a decline in patient visits? What weeks had lower numbers for doctor referrals? Remember to avoid the actual week of the holiday as your office was most likely closed for a few days or had reduced hours. Note which weeks started to trend downward and plan to offset that this year. Typically, you would want your marketing campaign to hit about three weeks before your slow week. So if the last week of November (aka Thanksgiving week) was slow, you would want your marketing to reach patients the first week of November. Using images of people raking leaves or shoveling snow. These can easily relate to back pain from seasonal chores and are great reasons for people to go to PT. During November, run a program to increase patient to patient referrals. Ask patients to refer someone who they are thankful for and, in turn, they will receive a Thank You gift card. Give Back and Get Back. Giving back or donating to the community is very popular during the holiday season. Coordinate with a local food bank, outreach group, or religious organization to generate good PR and community sponsorship. Have collection boxes at your clinic and run an incentive for those who donate. For example, persons who donate a toy for Toys for Tots at your clinic can get 15% off a massage or yoga class. Or, consider boosting January revenues by offering an incentive for half off personal training for those that donate to December drives. Many patients will have used up their insurance deductibles by late November and December. Send a postcard reminding patients to see you for PT now that it will be mostly or entirely covered by their insurance. HSA and FSA Close Outs. Depending on their policy requirements, some patients will have to use (or lose) their HSA or FSA balances. Encourage patients to do so by making appointments for PT. Does your clinic offer annual facility memberships for patients to continue using your gym after their therapy has ended? This could be a great opportunity for patients to pre-pay for next year’s membership. 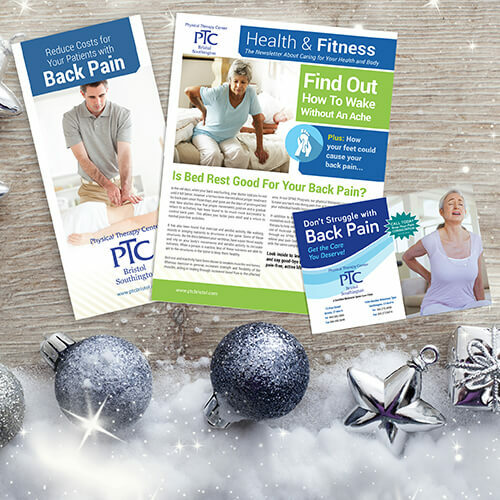 For more tips on holiday marketing for physical therapy practices, follow our blog and social media accounts. We love sharing tips from different industries and marketing experts!